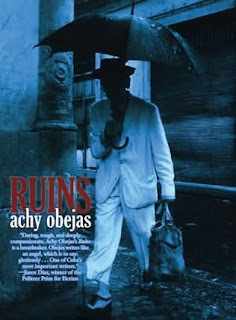 I Me My: Achy Obejas' Cocktail of Characters in "Ruins"! Usnavy, the die hard nationalist and chief protagonist of the novel, was quite a disappointment and did not make any impact; primarily because the delineation of his character appeared contrived and unoriginal. He reminded me of Old Major in Orwell's "Animal Farm" who dies half way through the novel spouting all that was supposedly 'good' about Animal(Commun)ism. Usnavy also has shades of Willy Loman from Miller's "Death of a Salesman" as the disgruntled idealist, and then there is a distinct similarity that Usnavy bears to Santiago of Hemmingway's "The Old Man and the Sea". These similarities made me feel cheated as a reader; it's almost like the writer put together a cocktail of characteristics from various welldrawn characters in literature and put them into her protagonist. Perhaps, readers who are not familiar with some of the characters I mentioned may find Usnavy appealing, and as a result, they may possibly enjoy the novel. However, even though Usnavy forced me to reminisce on some great characters in Literature, but that did not make him a memorable character. or Ruins a delectable read. Obviously, in my mind there was a stalemate in terms of the character of Usnavy, and I think that really ruined 'Ruins' for me. Hmmm interesting...Sometimes, the 'raving reviews' and our own humble review just don't match...Sometimes, I guess, an element of exoticism helps:(I haven't read this book but that's what I felt abt Jhumpa Lahiri's "The Namesake". Have you read it? Thanks for sharing! I certainly hope that she wasn't copying from other examples. If so she's wasting her time, she'll be found out sooner or later as she writes more. Cuba, and Castro has always been a fascination with my grandson. I don't think there is anything that he doesn't know about Cuba. And I have to agree with you that there is so much that could be written about Cuba and it's people especially during that time. But then again she is the author and apparently that is were her focus was. Hey III..have you dissected Amitav Gosh - Sea of Poppies..am reading it nowadays but..somehow i feel that with too much painstaking details of the setting..the books kinda loses its grip.